The goal of MFEM is to enable research and development of scalable finite element discretization and solver algorithms through general finite element abstractions, accurate and flexible visualization, and tight integration with the hypre library. 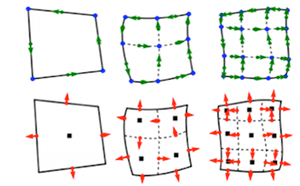 Conceptually, MFEM can be viewed as a finite element toolbox that provides the building blocks for developing finite element algorithms in a manner similar to that of MATLAB for linear algebra methods. NURBS spaces for isogeometric analysis. Many bilinear and linear forms defined on these spaces, as well as linear operators such as gradient, curl and embedding between these spaces, are available in the code. Hybridization and static condensation for high-order problems. surface meshes embedded in 3D, topologically periodic meshes, 1D meshes. Additional support for automated adaptive analysis and parallel unstructured modifications on simplex meshes is provided via integration with the PUMI distributed mesh management system. 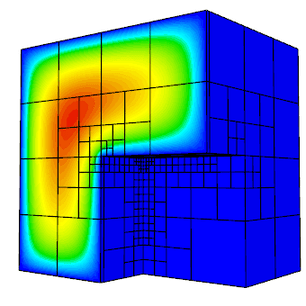 MFEM supports MPI-based parallelism throughout the library, and can readily be used as a scalable unstructured finite element problem generator. MFEM-based applications have been scaled to hundreds of thousands of parallel cores. The library supports efficient operator assembly/evaluation for tensor-product high-order elements. An experimental support for OpenMP acceleration is also included. A serial MFEM application typically requires minimal changes to transition to a scalable parallel version of the code, where it can take advantage of the integrated scalable linear solvers from the hypre library. Both of these versions can be further transitioned to high-performing templated variants, where operator assembly/evaluation is fully inlined for particular runtime parameters. MFEM is commonly used as a "finite element to linear algebra translator", since it can take a problem described in terms of finite element-type objects, and produce the corresponding linear algebra vectors and sparse matrices. Several matrix storage formats are available including dense, compressed sparse row (CSR) and parallel compressed sparse row (ParCSR). Block vectors, operators and [matrices][(http://mfem.github.io/doxygen/html/classmfem_1_1BlockMatrix.html] are also supported. solvers for nonlinear problems (Newton) and for single linearly constrained quadratic minimization problems. Example 19: incompressible nonlinear elasticity. Most of the examples have a serial and a parallel version, illustrating the ease of transition and the minimal code changes between the two. Many of the examples also have modifications that take advantage of optional third-party libraries such as PETSc, SUNDIALS and PUMI. Mesh Explorer: visualize and manipulate meshes. Mesh Optimizer: optimize high-order meshes. Mulard: multigroup thermal radiation diffusion mini application. The general (high-order) meshes and finite element functions in MFEM can be visualized accurately using the companion OpenGL visualization tool GLVis, which is built on top of MFEM. The VisIt visualization and analysis tool also natively supports MFEM formats. The MFEM code base is relatively small and is written in highly portable C++ (e.g. with very limited use of templates and the STL). The serial version of MFEM has no external dependencies and is straightforward to build on Linux, Mac and Windows machines. The MPI-parallel version uses two third-party libraries (hypre and METIS), and is also easy to build with an MPI compiler. On most machines, both versions can be built in under a minute by typing: "make serial -j" and "make parallel -j" respectively. The object-oriented design of MFEM separates the mesh, finite element and linear algebra abstractions, making it easy to extend the library and adapt it to a variety of applications. MFEM is an open-source software, and can be freely used under the terms of the LGPL 2.1 license.